Oi oi! 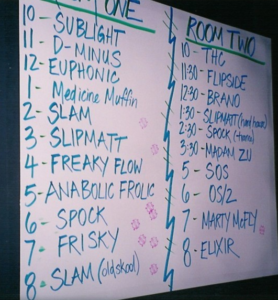 This week we welcome Brandon Sweet to talk about the Toronto rave scene of the 90s and 2000s. This is an epic chat of nostalgia about the hedonistic days of yore, fuelled above all else by our love of electronic music. Extra special thanks to Joe and Will StrangeFlow for their thoughtful voicemails, and especially to host Bianca for her patience! The song at the end of this week’s show is Shapes of Sleep by The Grid.